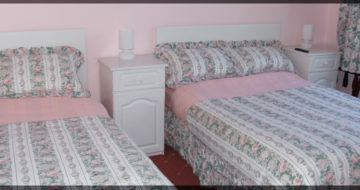 Welcome to the award winning, 4 Star Failte Ireland Approved St Thereses Bed & Breakfast. Set in its own private grounds just off the Courtown Road on the outskirts of Gorey Town, close to Courtown Harbour and Ballymoney Beach. The house is only one hour from Dublin and 50 minutes from Rosslare Ferryport, situated just off the M11 at junction 23, making it the ideal location for visiting the many attractions in the North Wexford and South Wicklow area. We have welcomed guests to our home for over 26 years and we assure you of a comfortable and relaxing stay in peaceful surroundings. Marlfield House Hotel | Ashdown Park Hotel | Seafield House Hotel | Amber Springs Hotel. We provide free transport the following morning for guests to return to hotels for their cars if required. Awards; 2014-2015-2016 & 2017 Trip Advisor Certificate of Excellence 5 Star.